Plug & Play Sony P2 protocol VTR's, ATR’;s, DAW’s .. 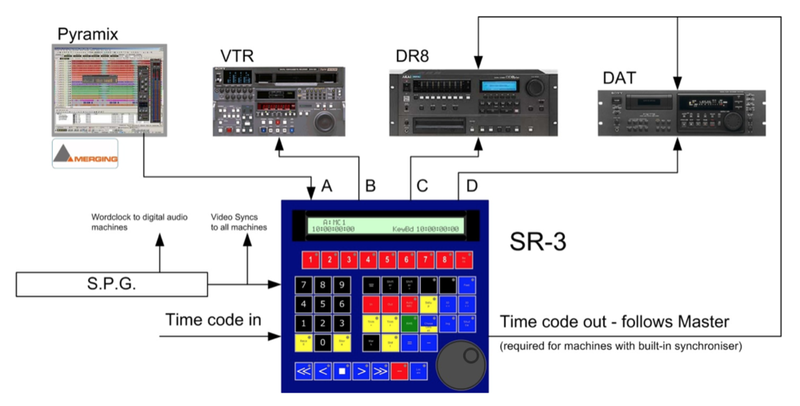 The SR Series remote controls have been designed as stand alone controllers or used to expand the single serial output of a Console or Digital Audio Work-station, the SR serial remotes make cost effective ergonomic solutions. The master machine or virtual machine(Generator) is controlled by the serial input, the chase function expands this to up to four machines. When the A port is configured as a input SR-4/SR-424 may be used with a Digital Audio Work-station or Console to provide control of up to 3 machines from one serial port. The record tracks are mapped so that the Serial input may have up to 64 record tracks. 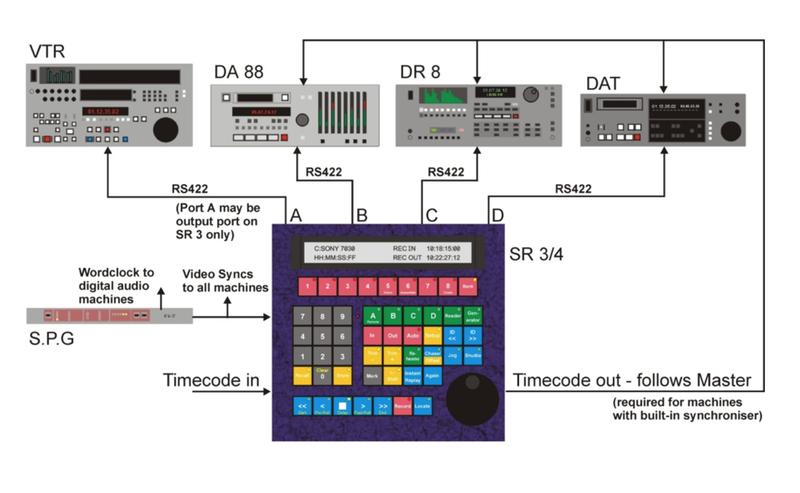 The timecode input enables the SR to act as a timecode to serial converter. Track arming from the front panel or via the input port is used to provide track arming, aA 24/48 track parallel to serial converter is also available. Record track arming is provided for up to 100 tracks and may be mapped to single or multiple machines by the user. Record On and Off are sent to all record enabled machines. Any of the 100+ user functions provided may be assigned to one of the macro keys providing a user configurable panel. The SR is compatible with the Windows CBServer software allowing full user control and multiple machine display. User options may be saved and recalled from disk using this software. IMPORTANT: You will need ROMUPD to update your firmware, please see below; to download please click on text.